The liturgical calendar is a yearly cycle that corresponds to the life of Jesus from His birth to His resurrection, and then to the outpouring of the Holy Spirit at Pentecost. It involves major holy days (Christmas, Easter, Pentecost) and seasons (Advent, Lent, Holy Week), and includes a few other significant days (Epiphany, Ash Wednesday, Good Friday, and Trinity Sunday) within these seasons. I did not grow up in a church that followed a liturgical calendar. We celebrated Easter and Christmas, but terms like Advent and Lent were lost on me. Recently, however, I’ve come to appreciate not only what these days and terms mean, but the value of participating in them. The church has a long and rich history of using the calendar to guide their worship throughout the year. The liturgical year begins with Advent, which starts four weeks prior to Christmas (the Christian new year actually begins at the end of November!). During these weeks, we focus our attention on Israel’s hope and longing for its Messiah to appear, seeing how the Old Testament prophesied and prepared God's people for their coming Savior. Advent is a season of expectation. As the saints of old awaited the coming of a Redeemer, we, like them, await Jesus’s return. Following Advent is the season of Christmas. According to tradition, Christmas is a 12 day celebration that begins December 25th and ends January 5th (hence the song, “Twelve Days of Christmas”). Punctuating the Christmas season is Epiphany. On this day, the church traditionally remembers the coming of the Magi to worship the Christ-child. Epiphany means “appearance,” so during this time the church focuses attention on the doctrine of the incarnation: the reality that God came to Earth in the flesh through Jesus Christ. After Epiphany, there is not another holy day until Ash Wednesday. Ash Wednesday is a day on the church calendar that marks the beginning of the season of Lent (see part 1 of this blog series for more on Ash Wednesday). Lent, which begins 46 days (40 weekdays plus 6 Sundays) before Easter is a season of fasting and preparation. It is intended to mimic the 40 days that Jesus spent in the wilderness being tested. The last seven days of Lent are called Holy Week, which recall the last days of Jesus on Earth before His crucifixion. Holy Week begins with Palm Sunday and ends on Holy Saturday (the day before Easter). During these six days we remember Jesus’s death for us and its significance. To help us focus on the meaning of Christ’s death, the church often holds a Maundy Thursday or a Good Friday service. Holy Week culminates with Resurrection Day (Easter). On this day we celebrate the resurrection of Jesus from the dead and its meaning: through His resurrection, Jesus conquered Satan, death, and hell. Fifty days after Easter is Pentecost, a day in which the church recounts the outpouring of the Holy Spirit recorded in Acts 2. The following Sunday, June 11th, is Trinity Sunday. On this day the church celebrates the mystery and wonder of our Triune God, and explores the importance of this doctrine. Ultimately, the hope in following the liturgical calendar is that as a church we would grow in our understanding of significant doctrines as we follow the life, death, and resurrection of Jesus. Through celebrating these special days and seasons, my hope is that our love, thankfulness, and faithfulness to God would increase. Growing up in an evangelical Christian home in Colorado Springs, I literally had no clue about Ash Wednesday as a kid. I had no exposure to it. Though I had one or two Catholic friends, to my recollection they never talked about it, and our paths rarely crossed outside of school settings. My family didn’t live close to downtown where most of the mainline churches that would’ve practiced Ash Wednesday were, so I had a slim chance of actually seeing someone with ashes on their forehead, and my church certainly never talked about it. It wasn’t until I was a teenager, now living in Mississippi, that I first encountered Ash Wednesday. When I noticed the ashen crosses smeared on the foreheads of some classmates, I naturally inquired about the marks. But I’m afraid the explanation I was given regarding them wasn’t all that helpful. I was told Ash Wednesday was something Catholics did to repent of all the drunk partying they did the day before on Fat Tuesday. It was presented to me as a day of cheap grace, a way to pay penance and be absolved for the previous day’s deliberate debauchery. I gradually discerned that those caricatures weren’t all that accurate, and that it was actually a holy day in the year many denominations practiced. It has only been in the past few years, though, that I’ve gained a clearer understanding and appreciation for Ash Wednesday. In fact, it has become a day that I’ve embraced and invite my church to participate in. Ash Wednesday is a day on the church calendar that marks the beginning of the season of Lent (in part two of this blog, which will post next week, I will explain the church calendar and Lent for those of you, like me, who grew up with no understanding of Lent either). For over 10 centuries, it has been a day set aside by Christians to remind us of our sinfulness and our mortality–that we are sinners who fall short of the glory of God; we are mortals destined for the grave. You came from the dust, and to the dust you shall return (Genesis 3:19). James 4:14 reminds us that life is like a mist that quickly vanishes. It’s here, and then it’s gone. The truth is we need Ash Wednesday. We need to be forced to look our frailty square in the eyes. We need to contemplate that we are sinful mortals. The bad news of our sinfulness prepares us to receive the good news of forgiveness found in Jesus Christ. The despair of death drives us to look toward Easter, when our Lord conquered the grave. So next Wednesday, March 6th, is Ash Wednesday, and our church, like many others, is hosting an Ash Wednesday service. We will gather from 5:30-6:15 p.m. to spend time reflecting on our sins, lament and confess them, and ask God to have mercy. We will be admonished to repent and believe the gospel. We will look to Jesus and plead His blood for our cleansing. For those who wish to participate, we will impose ashes, smearing a small cross on foreheads as a physical, felt, and visible mark of repentance, and a reminder of our need for Jesus’s death. I realize that for many of you, this will be a new practice. It might seem strange or cause you to feel uncomfortable. To be clear, participating in Ash Wednesday is neither a biblical or church requirement. You are no more or less Christian or holy if you take part or abstain. You are free in Christ! But I urge you to prayerfully consider coming. I believe this is a meaningful time to help us pause and recognize our need for grace. In a culture doing everything it can to distract us from the reality of sin and death, we need to give a due consideration to our mortality. Ultimately, Ash Wednesday is not morose or morbidly introspective; inasmuch as we look inward and repent, we also look upward and rejoice. Ash Wednesday sets the stage for Good Friday and Easter Sunday. I hope you’ll join me next Wednesday. 2018 has been a busy year for Immanuel, and 2019 promises to continue this trend! Check out our “2018 Year End Review” to see some of the highlights from this past year, and where we believe God is leading us next year. To make a year end donation, go to www.immanuelbirmingham.com/give or text any amount to 84321. You can also mail in donations to Immanuel Church, P.O. Box 320855, Birmingham, AL 35232. It’s pretty incredible to see how God has weaved together stories of adoption, foster care, and caring for vulnerable children and families at Immanuel Church. In a church of just over 100 members, right at 20% of us have either adopted, are in the process of adopting, or are serving as foster parents. With all of that said, we wanted to share some stories and perspectives from a few of these families and individuals. We hope that by answering a few questions about their own experiences, you will be prompted to 1) pray for them as they continue their journey in orphan care, and 2) learn about how caring for the fatherless has tangibly effected so many of the families that we are walking in community with. As a waiting family, how can our church body best support you and pray for you? Mostly, for us, we always appreciate prayers for patience and discernment. We want to be sure during the waiting period we are being diligent to seek God’s will for our family and that in the unknown we are trusting in His timing for our family. We love when people check in and ask us how we are doing because it is a good reminder that even if nothing is moving forward at the moment, God is still working in ways we can’t always see. What would you say to families who are praying through building their family through adoption? Pray together and seek biblical wisdom. Talk to other families who have been through the process. Do your research and pray over it. A lot of what we learned about the adoption process we didn’t learn until after we were in it. But connecting with other families who had adopted or were adopting really helped us navigate the process. Remember that there are a lot of decisions to make, and praying for God’s guidance and seeking His word above all else will help you through all those decisions. Look at your finances, look at the health of your marriage, look at your goals, and then put all that together to convey to others and the Lord to see if it makes sense. How did your and your spouse decide to build your family through adoption? The Lord prepared my heart (Carly) for this from early on in life. I've always had a heart for vulnerable children and also knew that He would have us pursue adoption. Hunter took a little bit of time to come around to the idea of adoption, but in seeking the Lord’s plan through scripture and prayer it was kind of like, “Well why we wouldn't we pursue adoption?” We all are commanded to care for orphans in different ways, but for us, practically, we have the resources and the love to open our family! What has been the most challenging part of the adoption process so far? The long months of silence. Updates, even if they are new updates, are beneficial for the heart. It is easy for those who are around you daily to forget that you are adopting and that hurts a little. Even though we have been waiting so long, this kiddo is still at the forefront of our every day minds. How do I know if God is calling me to adopt? First, it's important to remember that we, as Christians, are ALL called to care for orphans. So don't wait for a lightning bolt "aha" moment before pursuing ways your family can care for the fatherless. Instead, go ahead and do some research to help you make an informed decision. Ask other adoptive families for information about the process to find out what the journey looks like. Read books about parenting kids from hard places. Google adoption agencies to find out the financial cost. Lastly, examine your heart to make sure you're pursuing adoption in obedience to the Lord and by the power of His grace, not as a means to "rescue" a child, be a more interesting family, or heal your own hurts from infertility or other past traumas. Sadly, sometimes international adoption is not done ethically. An estimated 90% of kids in orphanages worldwide have at least one living parent, the majority of whom could be reunited with families if they're provided with proper resources. Sometimes women place their children in orphanages in a time of desperation, expecting to come back and get their children once they are economically more stable, only to discover their child has been adopted to a family in another country. Even more nefarious, some women are incentivized to place their child for adoption, promising them that their child will be better off. This devalues these mothers and strips them of their dignity that they cannot even parent their child as well as a wealthy, white American. Sometimes adoption agencies unintentionally just don't know or don't follow all of the complicated procedures of adoption when working with two national governments. However, in spite of these struggles, international adoption CAN be done ethically, and those kids need families just like anyone else! Before committing to adopt internationally, you need to seriously vet your potential adoption agency, and be ready to ask challenging questions about the family history of the children being referred in order to ensure that the child truly is in need of adoption. It's also important to support ministries who prioritize family preservation in developing nations so mothers don't have to make the decision to put their kids in an orphanage. What has adoption taught you about your adoption into God’s family and your relationship with Him? Adoption is a central theme of the Gospel. The love our Father has for us is freely given and He values every being in his creation. He accepts us into His family through Christ regardless of our circumstances, social standing or geographic location. Our God is merciful in His love for us and we hope that our children receive His grace through how we parent them. We are honored that the Lord brought our children into our family from across the world and has entrusted us to shepherd their precious hearts! How did God work in such long wait for one child and such fast process of another? We have learned through our vastly different experiences with adoption to lean on the Lord and accept that all things work according to His purpose. We longed and waited and pleaded with God for years for Phoenix — and in our Father’s timing he joined our family and he has blessed us indescribably. Kiera’s sudden arrival brought much need for trusting God for His provision and wisdom, and has proven what good gifts our Father gives if we are willing to be obedient. As we watch them grow everyday in their sibling relationship, we rejoice in the miracle our Father has worked in our family’s life. They complement one another perfectly and it is beautiful to see how He brought both of them to be in our family. Why is orphan care a gospel issue? From the most basic reason, orphan care is commanded of believers in the book of James. But further, orphan care is a clear picture of the gospel. It is caring for the fatherless as God chose to care for us by adopting us through His Son. Orphan care also is a way to share in God's love for all people. Orphans are a people group that is made up of many races, ages, and backgrounds. Caring for orphans, although messy, is beautiful. If we do not feel called to adopt, what can we do? Many times, we shy away from orphan care if we are not planning to adopt. However, everyone can be a part of orphan care. As everyone knows, adoption can be expensive. Entering in to an adoption can feel overwhelming because of the financial burden, so any way you can financially support families who are adopting is a blessing. Also, praying for families who are adopting and asking for specific ways to pray reminds adoptive families that they are not forgotten. Since adopting can take time, it often can feel lonely, so any vocal encouragement goes a long way. Committing to walk alongside those who are adopting, whether it takes two months or five years, is a way we can care for orphans. Once families are home, continue to support them, that is when the hard work truly begins. Asking ways that you as friends/family can help foster (not harm) attachment, or simply asking how the family is doing goes a long way. And when you ask, be willing to hear the good, bad, and ugly. Many times those on the outside just see the sweet picture of adoption, which it is, but bringing a child from a hard place is challenging in a lot of ways. Allowing adoptive families the freedom to share the struggles is very healing. How do we do deal with trauma that children have endured prior to their adoption? Good doctors and therapists help, but we can only do this knowing we have a Savior who called us to this life and He provides more than we need. And we are thankful for grace because we get it wrong more often than we get it right. How did you decide which country to adopt from? We didn’t choose Ukraine; Ukraine chose us. By that I mean that God kept turning us toward Ukraine every time we thought about some where else. People often ask how or why we made our choice, and truly God just kept confirming and leading us back to Ukraine around every corner. Knowing what you know now, and all of the life you’ve walked through with your three children, would you do it over again? What is it like to have an open adoption with biological relatives? We have an open adoption with our daughter’s birth mother as well as her biological brother (also adopted and lives in Birmingham). When we began praying about beginning a domestic adoption process after 2 years in the international adoption process, we were most nervous about what an open adoption would look like. However, the more we prayed through it, we came to realize that an open adoption can be really healthy for a child who has been adopted (with appropriate boundaries, of course). When we began the adoption process internationally five years ago, we didn’t think we’d ever have information about our child(ren)’s biological families because of the nature of international adoption. That could likely still be the case with our Haiti adoption, however the fact that we’re able to give our daughter the gift of biological family is something we’ll always be thankful for. We have pictures with her birth mother from the day she was born, and we text and send pictures a few times a year. While our daughter may never be interested some of the information we have about her biological family, I’m thankful that we have answers to provide her if and when questions arise. One thing is for sure, open adoption makes us no less of her mommy and daddy, but instead allows us to share a much fuller picture of her adoption story that we imagined possible. Additionally, getting to have a friendship with our daughter’s biological brother and his family is just about the greatest thing we never knew we wanted. We love that she has a biological sibling growing up just down the road and that they will get to always know and care for each other. How has a five year (and counting) wait impacted your faith? We began the international adoption process on December 1, 2013, and we’re probably three or more years away from bringing home a child from Haiti. We’ve encountered agency closures, country suspensions and closures, starting over several times with new paperwork, and a brief hiatus when we weren’t sure where God was leading us next. There have been times when we’ve felt like God was leading us to something that would never happen. Frankly, there are still days like that when doubt is king and it takes every ounce of faith we have to believe that God is big enough to orchestrate it all. Other days are full of excitement for what’s to come. Mostly, seeing how perfectly God divinely planned our daughter’s adoption has led us to a place where our trust in His perfect plan is greater than ever. As a family we have come to really love Romans 4:17 that says that God calls things into existence that do not exist. We believe this has been a theme for us — from providing a family for one child who needed a family, and Lord-willing another in a few years, to doors that have been opened and shut that truly no one could have ever foreseen. It has been a hard five years, and it will continue to be hard to wait, but God is working in our waiting and He provides grace to us on the hardest days. How did the Lord lead you to become a foster parent? I was in a season of transition. The Lord was pulling me away from ministry I had been doing and I knew He was calling me to something different. I spent some time going before Him asking Him to show me something that would use the strengths, abilities, and experiences He had put in my life for His glory. He led me to foster care. What challenges you have walked through as a foster parent? God has repeatedly reminded me I can do nothing in my own strength. My life is not my own, I am hidden in Christ. When I try to parent these kids on my own, I fail miserably. He gives us what we need daily. How can our church best support you as a foster parent? Pray and check-in. There is no question in my mind that the enemy has firmly laid plans that he seeks to accomplish in the lives of these broken families and hurting children. It is imperative that we pray. We need to pray for biological families to find hope and restoration in the gospel; for the hearts of children in care to find safety, love, and stability in the midst of constant transitions and unknowns; and for foster families to remain steadfast in providing for the daily needs of a child who many be in their home for a week, a month, or years. Another way to support foster families is simply to check in. Ask how they’re doing and ask about any needs – whether that be specific ways you can pray, ways that you can serve, or tangible items that you may be able to provide. I’d like to share too that oftentimes we (foster parents) are not allowed to share the details of our cases, so while we deeply appreciate your care in taking time to ask questions, we may need to be vague in our responses. Please know that has nothing to do with you personally or our level of trust in you, but rather everything to do with protecting legal and oftentimes sensitive information. How have you been able to build a support system for yourself, and what role does that support system play? I feel confident I would not be fostering without the full support of my GC and our church as a whole. It is imperative to have community that you can trust, ask for help, share your struggles, and depend on. These friends have stepped in to meet spiritual needs through prayer and encouragement, emotional needs through intentional listening and answering texts at 3am (literally! ), and even physical support through providing meals, diapers, babysitting, etc. If you would like to get connected to one or some of these families to learn more about adoption, foster care, and caring for the vulnerable, please email us at connect@immanuelbirmingham.com and we’d love to get you in contact with them. Yesterday was Orphan Sunday at Immanuel, and we heard an awesome word from Dr. Rick Morton, which you can listen to here. If you weren’t able to join us for worship, you should take time to listen to the message so that you understand just how close to the heart of God caring for vulnerable children is, then prayerfully consider your role in putting your faith to action. Below are several ways you can get involved — from prayer to becoming an adoptive or foster parent, there are ways for everyone to care for the vulnerable. 1. Pray about becoming an adoptive family. We have families in our church body who have adopted domestically and internationally (and some both!). Please feel free to seek them out if you are praying through entering into the adoption process. They would love to share their story with you. 2. Support adoptive families with your time and resources. Not every family is called to adopt, but we are all called to serve the fatherless. If you know an adoptive family, consider donating to their adoption fund, bringing them a meal when they come home, or watching their other children while they walk through the process of attachment and bonding. 3. Take an interest in adoptive families’ stories. If you don’t know much about adoption, process, the correct language to use, or more, ask an adoptive parent to coffee and ask questions! Ask how God led them to build their family through adoption, how they could use prayer, and how you can love them well. It’s okay to ask questions, even if you aren’t sure if you’re using the right terminology or you aren’t exactly sure how to phrase your questions. 1. Pray about becoming a foster parent or family. We have several foster parents in our church body who have been fostering for various lengths of time. Please feel free to seek them out if you are praying through entering into becoming a licensed foster parent. If you don’t feel like you have the capability to become a full-time foster parent at this time, consider becoming licensed to provide respite care to foster families in our community. 2. Be present. Invest spiritually. Give time. Many children who are placed in foster homes desperately need to be exposed to the gospel, experience Christ-centered male leadership, and to be cared for without hesitation. Of course foster families are doing these things, however as the Church, we can do this too! Being present, giving of your time, and sewing spiritual seeds will make a life-long impact on the children that enter our body through foster care placements. 3. Be aware and be sensitive. Children who have been placed in foster care are many times coming from very difficult circumstances where they have experienced and observed unimaginable trauma. This is NOT their fault. Sometimes their experiences will cause them to act out or say things that we are not used to hearing or seeing, or that may be inappropriate. Being aware and sensitive to these things and giving grace upon grace is of the utmost importance for the well-being of the individual child and the foster family. If you see a difficult situation developing, ask a foster parent the best way to help. Remember to have patience, and again, give lots of grace. 1. Help out (more) with Families Count. As a church, we host Families Count twice a year. We have opportunities to mentor attendees, provide transportation, help with childcare, and provide weekly meals. Typically, the Bluff Park GC spearheads these efforts and organizes everything, however they would love for you to help out! We currently have a Families Count class going on and we will have another in the spring. Become a volunteer mentor for the Aspire Movement. Sign up to be a volunteer tutor or mentor at Grace House Ministries. Contact Alabama Baptist Children’s Homes to find out how to become a direct care volunteer. Become a prayer partner or church advocate at Lifeline Children’s Services. All across our city there are ways to get plugged in to organizations that are Christ-centered and doing important work for vulnerable children and families. Whether you donate to a family who is raising funds for their own adoption or you donate to an organization who mobilizes care for orphans and vulnerable children, giving of the money that God has given you makes a huge impact. Most organizations operate on a very slim budget, and most families who are called to adopt make financial sacrifices to be able to do so. By giving of your own financial resources, you can partner alongside families and organizations doing gospel work as we all care for the fatherless together. 4. Serve the fatherless, both here and abroad. Not only are there ways to get involved serving vulnerable children right here in our community, but there are so many opportunities to travel to other countries to care for children. Organizations such as World Orphans, (un)adoption (through Lifeline Children’s Services), and The Haiti Collective plan multiple trips a year and need people to sign up to go and serve. There are over 153,000,000 orphans and vulnerable children in the world. Just in Alabama there are approximately 6,000 children in the foster care system. This is a crisis, and we must be in prayer for the children and families that this impacts so greatly. 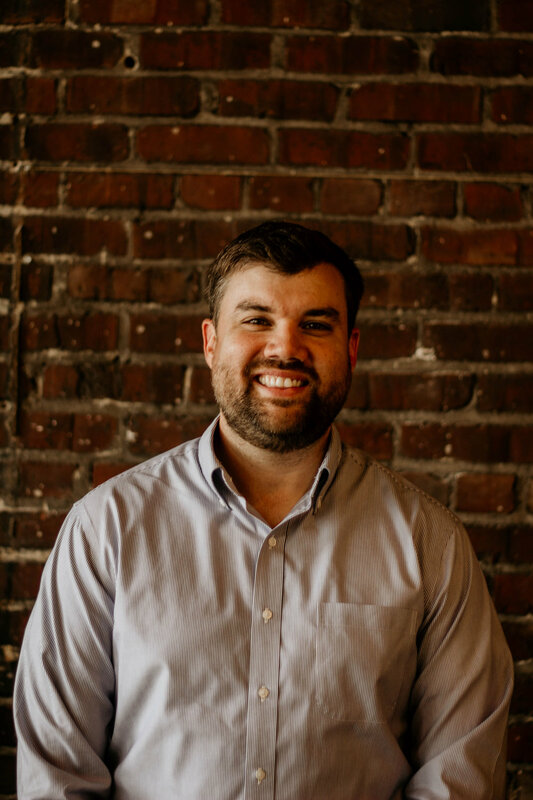 If you would like more information about any of these ideas on how to get involved with adoption, foster care, or vulnerable children and/or families, please do not hesitate to reach out to us at connect@immanuelbirmingham.com. We will be sure to help you get in touch with the right person or organization. These are two brief but power-packed verses about the relationship between husbands and wives. After 40 minutes of preaching, I only managed to cover point number one in my outline, but figured I better bring things to a close. Since then, several of you have asked me if I’m going to preach a part two, or if I’ll share the other points I had intended to address. In lieu of preaching another sermon, I’m going to share my other two points in blog form below. But before diving into points two and three, let me briefly recap point one. If you’d like to go back and listen to the sermon, you can do so here. In fact, I’d encourage you to do so if you haven’t already listened to it. Much of the message addresses misunderstanding and confusion, both outside and inside the church, regarding what Scripture teaches concerning men and women and their roles in the family. Caveats and clarifications are needed when it comes to the language of “submission” and “headship”, and they are offered in the sermon. For brevity’s sake, I’m not going to repeat everything I’ve already said in that message. What follows is a very brief outline of the basic idea of my first point, and then points two and three will follow. When it comes to the marriage relationship, what the Bible shows us is that there is a pattern, established by God, for how He intends the marriage relationship to work. The pattern is male and female fulfilling interdependent roles as husband and wife. This pattern is revealed in the different verbs assigned to wives and husbands regarding their relationship with one another. Each has a role to play in the marriage, but it looks a little bit different for each party. This differentiation goes all the way back to creation (Genesis 1-2), and it can be traced throughout the Scriptures. To the wife, the particular action Paul conveys in Colossians 3:18 is “submit”. To the husband, the particular action Paul conveys in Colossians 3:19 is “love”. God has designed marriage to flourish when the husband is leading the way by expressing Christ-like love to his wife, and then the wife in turn, is voluntarily yielding herself to her husband’s lead (submitting to her husband). The pattern he intends is that men lead their families in such a way that they are leveraging their lives to tenderly love and care for those under their watchcare, and wives are voluntarily yielding to their husband’s lead and coming alongside of them as a co-pilot. Each partner lives for the sake of the other; each is serving the other. Again, there’s so much to be unpacked and said here, which I attempted to do in my sermon. If you have questions, concerns, objections, clarifications, go and listen to my sermon and see if it addresses it. One of the things I alluded to in my sermon is that Paul’s instructions for husbands and wives were radical for its place and time. On the surface, exhorting a wife to submit to her husband may not sound very radical for an extremely patriarchal first century society, but if you look a little closer, you’ll find that it actually is. Consider the fact that Paul directly addressed the wives (not the husbands) and exhorted them to submit to their husbands. Paul’s direct address to the women in Colossae reveals their equality with men, and that in the Christian home (unlike many other households in the Roman world), submission is not a forced act. Husbands aren’t to demand or enforce submission; rather, wives are to do it voluntarily. This reflects a high view of women, much higher than the culture at the time. According to scripture, women (wives) are equal in dignity to men. When it comes to one’s acceptance and status with God, there is no difference between sexes (Gal. 3:27), again, this was a radical idea in the first century. The distinction between men and women (husbands and wives) in the Bible is never one of inherent value, only one of order and roles. Thus, submission is not an issue of inferiority, merely one of economy in the home. Paul exhorts Christian women to voluntarily yield to the leadership of their own husband (and only their own husband; not to any other man) according to God’s design for the marriage relationship. But in doing so, he establishes their status as an equal partner. The strangeness of Paul’s command is even more obvious in what he expresses to husbands. They are to agapao (covenantally love) their wives. According to Douglass Moo, no other household code that has been discovered from the ancient world requires husbands to love their wives. The command that husbands love their wives introduces a somewhat revolutionary idea that is a hallmark of Christianity. In the time and place in which Paul was writing, the command for husbands to sacrificially love their wives would’ve been rather scandalous. Many men at that time believed that they had the freedom to leave their wife and divorce her for any reason whatsoever. For a husband to devote himself to serving and loving his wife was an extreme idea. And it’s still weird today. While most men bemoan their “ball-and-chain” and fantasize about “hall pass” weekends in Vegas, a man who remains committed, faithful, and devoted to caring for his wife is increasingly peculiar. It would’ve been strange in the first century to see Christian wives being treated as equal partners in the home. It would’ve been strange to see them, nonetheless, willfully submit to their husband’s leadership. It would’ve been strange to see husbands sacrificially loving their wives, leveraging their leadership in the name of serving someone other than themselves. This peculiarity is by design. God has always intended for His covenant people to be distinct from the world. Israel was called to keep the covenant stipulations God laid out for them, which were designed to make them different from all other peoples so that they would function as a kingdom of priests unto the nations. They were to be a holy nation – a people group devoted to Yahweh and distinct from all others, that they might show the world God’s character and covenant faithfulness. God desires for us, His covenant people, is to be different than the world. And one way that He intends for us to be distinct is through our marriages. The Christian marriage relationship ought to look distinctively different than secular marriage. Christian men serving and loving their wives, and Christian woman respectfully supporting and encouraging their husbands is how God intends that to happen. It was radically counter-cultural in the first century, and it’s still peculiar today. But God doesn’t want us to be different, simply to be different. Our peculiarity has a purpose. God intends for the noticeable difference in Christian marriages to be attractive to a watching world. Unlike the culture’s idea of relationships, which take a me-centered approach, God’s idea for marriage is that it is other-centered. Seeing a wife gladly yield to her husband’s lead, and a husband leveraging his leadership to love and serve his wife is beautiful. And that is because Christian marriage is not an end in itself; it is also, by design, a picture of the relationship between Christ and the church. God intends for every Christian marriage to echo the story of the gospel. Understand what Paul is saying in this passage. He is not saying that the relationship between Christ and the church is a good example for husbands and wives to follow. That is certainly true, but that’s not what Paul is saying. He is saying that Christian marriage is a living portrayal of the relationship between Christ and the church. And this is why our roles in marriage matter, and why fulfilling our calling as husbands and wives is critical. To the extent that Christian husbands daily lay down their lives for their wives, they portray and echo Jesus’ sacrificial love for the church. To the extent that Christian wives gladly submit to their husbands, they demonstrate how worthy Jesus is of our trust and devotion. Christian marriage is a stage to daily re-enact the gospel. And Lord willing, as husbands love their wives and wives support their husbands, the peculiarity of that other-centered humility and sacrifice will be noticed. It will prompt questions and opportunities to then testify of Jesus’ sacrificial love, and His faithful headship. The purpose of Christian marriage, ultimately is to testify of the glory of the gospel. 1. Have a set time (or times) to pray every day - Zig Ziglar famously said, "If you aim at nothing, you'll hit it every time." Without a set time to pray, chances are you won't get around to it. A healthy prayer life requires discipline. It won't just happen. You need to choose a time that you plan on getting alone and talking to God. Then, invite an accountability partner to help you be disciplined to actually stick to praying during this time. 2. Keep a list - When you sit down to pray, do you have a way of guiding yourself along, or do you just shoot from the hip? It's okay to pray extemporaneously; in fact, I would expect that the Holy Spirit will, from time to time, prompt you to pray for certain people and things that you didn't enter into prayer thinking about. That said, it's a good idea to go into your time of prayer with a list of petitions and needs to bring before the Lord. Within that list, you might want to create categories (worship and adoration, thanksgiving, kingdom come prayers, bereavement and suffering, sickness, etc). Throughout the week, you can update and add to your list (smartphones are great for this) and that way anytime you pull away to pray, you have fuel for the fire. 3. Use Scripture - George Mueller is one of the greatest men of prayer the world has ever known. If you don't believe me, check out his biography. His prayer life, however, was not always so great. In fact, he once wrote in his journal that he would often waste a half hour just trying to get himself into a spirit of prayer (a lot of us would've given up a lot sooner, I'm afraid). But then Mueller discovered a something that transformed his praying. He began to use God's Word as a prompt for prayer. This has helped my own prayer life tremendously. When you use a passage of scripture to guide your prayer, you no longer have to struggle for words, the words are right there in front of you, divinely inspired! You simply take them, pray them back to God, and apply them to your life. Check out this brief video by Dr. Whitney where he models this method for prayer! 4. Pray With Others - There are times when, for some reason, it's really hard for me to pray by myself or for myself. I know I need to pray, but I'm weak in faith and my spirit feels dry and weary. In those times I’ve found that I need to pull some people in to pray with me. They can pray for me what I might struggle to pray for myself, and vice versa. Make it a habit to pray with brothers and sisters in Christ. Be vulnerable with them about your current struggles and needs. To the extent that they know what you're facing, they can pray with you and for you. 5. Remind Yourself Often That Prayer Is The Weapon - The way that the Kingdom of God will advance in and through our lives is by prayer. Psalm 20:7 says, "Some trust in chariots and some in horses, but we trust in the name of the Lord our God. They collapse and fall, but we rise and stand upright." How is it that we exhibit trust in God? We demonstrate faith in God through dependent prayer. If we try to live our lives without prayer, we are trusting in modern day chariots that will fail us. Prayer is the weapon of our warfare. It is the way we will make progress and push back the gates of hell. Remind yourself every day that your battle is not against flesh and blood but against the spiritual forces of darkness in the heavenly realm. Pray accordingly. This Sunday we begin a three month journey through the book of Colossians. I am tremendously excited about diving into this book of the bible together as a faith family! I have high hopes that the next 12 weeks are going to be an encouraging, challenging, refreshing, and life-changing time, not in any way because of who is preaching, but because of who inspired the words of this book, and the theme of its content. Colossians is a letter written by the Apostle Paul to the church in Colossae sometime around the year AD 50. It was written to a group of believers who needed to be encouraged and reminded not to drift away from the gospel toward other religious ideas, but to place their hope squarely in Christ, because He is supremely glorious and sufficient to save in every way. That’s what the book of Colossians is about! It’s about the supremacy and the sufficiency of Jesus Christ. This is a timely word for us as well, who are so often tempted to doubt the ability of Jesus to fully save us or satisfy our souls. My hope, as we journey through this God-breathed letter together, is that our souls will be awestruck by the glory of Christ, and that the Spirit will lead us to rest upon His grace. Streetlights is a resource for listening to the Bible. The team at Streetlights have read and recorded the entire New Testament and hosted it online *for free* to use for our listening pleasure. And this isn’t your run-of-the-mill recording either. The Streetlight readers read with inflection and intonation, backed by subtle electronic and hip hop beats, making the listening moment dynamic and engaging. The scriptures really come to life as you listen. I’ve been using Streetlights to soak in the book of Colossians over the past few weeks and it has greatly helped my overall grasp of the letter. You can find out more by going to http://www.streetlightsbible.com/ and you can download the app by searching “Streetlights”. 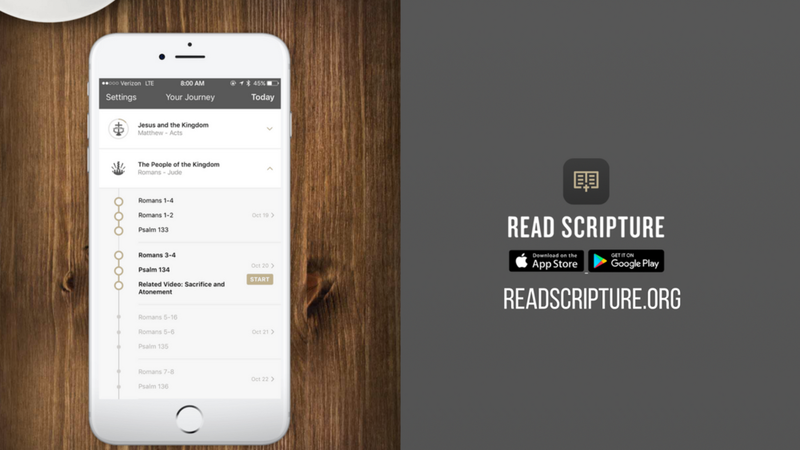 The Read Scripture app is a great bible reading resource. It gives you a way to read the bible chronologically, in an organized way, and to track your progress. One fantastic resource available through this app are the introductory videos before each book of the bible. Each video provides some context and sets up the book so that you know where you are in the overall story of Scripture, as well as key ideas and themes you’ll encounter as you read. As we dive into the book of Colossians, I recommend that you download this app (again, FREE!) and watch the Introduction to Colossians video. It will help you understand the occasion for the letter, and prepare you as we jump into this book on Sunday. You can find the app by searching “Read Scripture” on the app store, and you can learn more by going to http://www.readscripture.org/. I hope you’ll take time between now and Sunday, not only to check out these resources, but to pray and to ask God to speak to you as we begin this journey in Colossians. Let’s commit to being present each Sunday for worship, and to going deeper with our Gospel Communities. If we do, I believe this series will leave an indelible mark on our church.